I've always had good experiences when buying online from Ishibashi Music in Japan. Their service has always been top-notch, and I like the fact that they always try to be as thorough as possible when describing an item a customer might be interested in. But they do get a large volume of incoming emails everyday, and only a small handful of staff who are able to answer emails in English, which means that a one or two day wait for a reply is the norm. I ordered my Gibson Firebird V from Ishibashi's U-Box or used item listing a year ago, last September. Yeah I know, it's taken me that long to blog about it. Hello! This is ____ from Ishibashi Music, Shibuya. 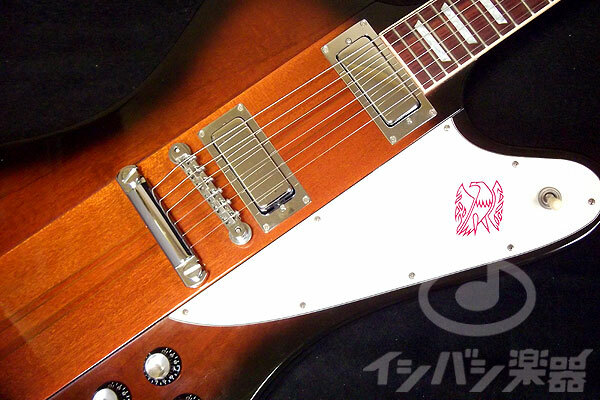 Thank you for sending our Kobe Sannomiya branch an inquiry of the used GIBSON FIREBIRD VS (316212705). As all international orders are handeled here at Shibuya, I am writing back to you on behalf of them. - No outstanding damages such as big dents, finish chips or cracks are found on this guitar, except for some minor picking scratches and small dents. - The condition of the neck is good, not warped or twisted. - Fret wear is just a little. The remainder of the frets are approx. 80%. - The color of the hardwares are still shiny. - No parts seems to have been modified, replaced or missing. - No problem with the electronics. - The playing condition is good. - The guitar comes with a hardshell case. Thorough and descriptive like I mentioned. And they even provided me with additional pictures of the guitar. I sent them another email to confirm and received bank wire transfer details. I prefer bank transfers instead of credit card payments in these cases as it gives me solid documentation of my purchase --a bit of a hassle with the $20 bank wire charge from my bank but worth it, I feel. After confirming payment on their end which took one additional business day, the guitar was shipped promptly within hours. I even got a EMS tracking number so I could track my purchase all the way from Shibuya, to Narita airport, right up to my doorstep. Speaking of doorsteps, the visitor intercom to my apartment wasn't working on the morning the guitar arrived, which was, literally, a day after they shipped it! Which meant that I had to schlep all the way to the post office the next business day to pick the guitar up. I was really happy with the way the guitar was packed. Removing the outer protective cardboard box, I found the hardcase within thoroughly bubble-wrapped with the guitar snug inside. And my first hands-on experience with the huge Firebird hardcase was that it does not fit in the boot of a cab. So the backseat it was. Since the earthquake and tsunami in Japan in March 2011, Ishibashi has shortened their working hours as part of the energy conservation program so they might take longer in answering incoming emails. But from what I understand it's business as usual. Congrats on your newest acquisition, Clint. Would love to hear you play it some day! Cheers! Rey. Thanks Rey! All the Best in Barcelona! Hope to visit some day.